In the early years of colonial New Zealand, the roads and tracks were so difficult, it was much easier to travel by water. That’s the reason why, in this review of the architecture of St Paul’s written two years after it was finished, by Richard Taylor, one of New Zealand’s early Anglican missionaries, his comment was about the view of the church from the sea, and the first impressions it gave to visitors to Wellington. What he saw was not favourable. In the city of Wellington there are now two churches of wood. The new one of St Paul is used as the cathedral; it was only finished in 1866. Its external appearance is bad. The intended tower and spire being cut down to such diminished proportions from lack of funds, that to those entering the harbour, instead of appearing conspicuously as a spire pointing to the skies, it looks only like an extinguisher* placed on the roof, an unhappy emblem for a cathedral church, from which the largest portion of light is expected to proceed. May this defect be speedily rectified, as at present it has no distinctive features to show, at the first view of the city, that it is even a church, much less a cathedral. But its interior is very neat, if not elegant. Main image – a detail from a larger photo taken in 1872 (only four years after this comment was written) by James Francis Meadows, Ref: PAColl-7949-02. Alexander Turnbull Library, Wellington. 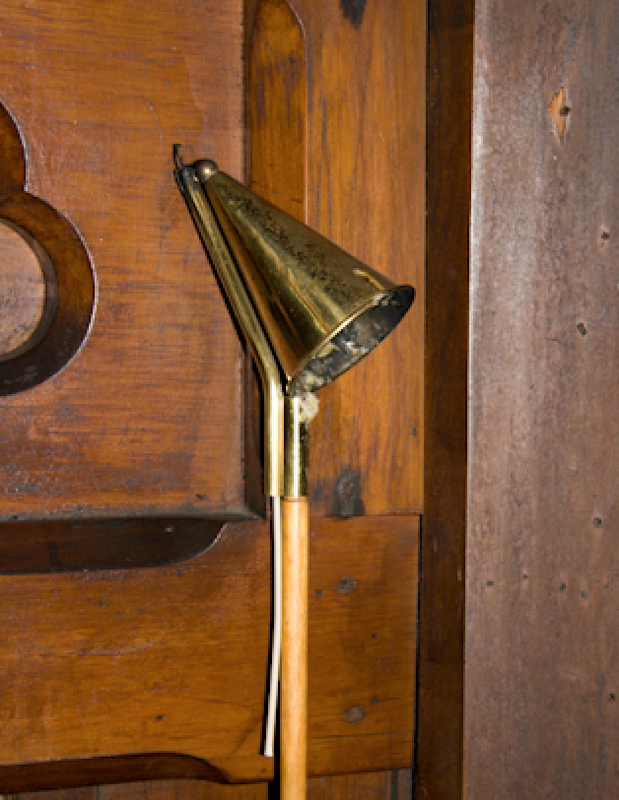 Extinguisher/candle snuffer is from the Old St Paul’s collection. Photo: Heritage New Zealand.